From the disturbing images of police repressing indigenous resistance in Standing Rock to the often unreported near-daily SWAT raids in Black and Brown neighborhoods in our cities, we know that police militarization is a violent strategy of containment, control, and warfare. But we also know that all over the world, people are fighting back. The Stop Urban Shield coalition sees its work as a tangible and winnable step toward diminishing the destructive impacts of police militarization that serves to destabilize our communities. 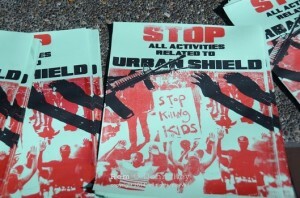 In 2016 the organizations that make us Stop Urban Shield have been proud to come together with others to educate ourselves about the shady path of resources and power involved in police militarization, to strategize to disrupt that toxic flow, and to take bold and inspiring actions against warfare in our neighborhoods and cities. 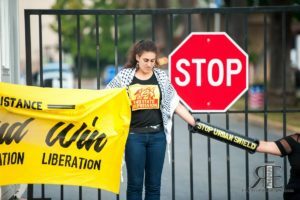 In 2016 many hours of outreach and building with community member and organizations culminated in a powerful direct action and civil disobedience against the Urban Shield weapons expo in Pleasanton in September. This mobilization disrupted both the expo and some of the war games crucial to an increase in police militarization. Building on the momentum of that action, we were also able compel elected officials in Alameda County to finally call critical questions about Urban Shield and the unaccountable and untransparent power exercised by the Sheriff’s office in controlling this program. All of this work was held together by different volunteer members of our coalition thinking together to research, analyze, understand, and critique Urban Shield. We are proud to this year to have issued our report Urban Shield: Abandoning Hope Not Build Hope as a strong educational foundation to our work. Moving into 2017, people are all too aware that the destruction being proposed by the incoming Trump regime will require a redoubling of our efforts to come together, to defend our communities, and to fight back. Trump’s campaign has been a platform of fear-mongering and hate – calling for increased policing, mass deportations, surveillance, registries, detention and deportation of immigrant and Muslim communities, and has even labelled social movements like Black Lives Matter as terrorist organizations. The communities that will be highly targeted and affected under a Trump administration are the same ones targeted by policing and militarization programs like Urban Shield. Stopping Urban Shield in Alameda County is a key local step to resisting the threats posed by Trump. Alameda County must stop sponsoring the racist, xenophobic, and lethal strategies, tactics, and technologies being spread by Urban Shield. Ending Urban Shield is more important than ever. Just days after the Start of 2017 we invite you to take action to stop Urban Shield. On January 10, 2017, due to community pressure, the Alameda County Board of Supervisors will conduct a long overdue information session on Urban Shield. We know that the Sheriff will use every trick in his book to rationalize and defend this violent program. We need as many of our people there to raise our voices and share the true impacts of Urban Shield and police militarization, and to compel the Board to take the only rational and humane step possible: Stop Urban Shield. Following the Press Conference and Rally, we will pack the Supervisors Meeting to show our county’s elected officials Urban Shield needs to be ended once and for all! P.S. Are you an Alameda County resident? Sign our petition! 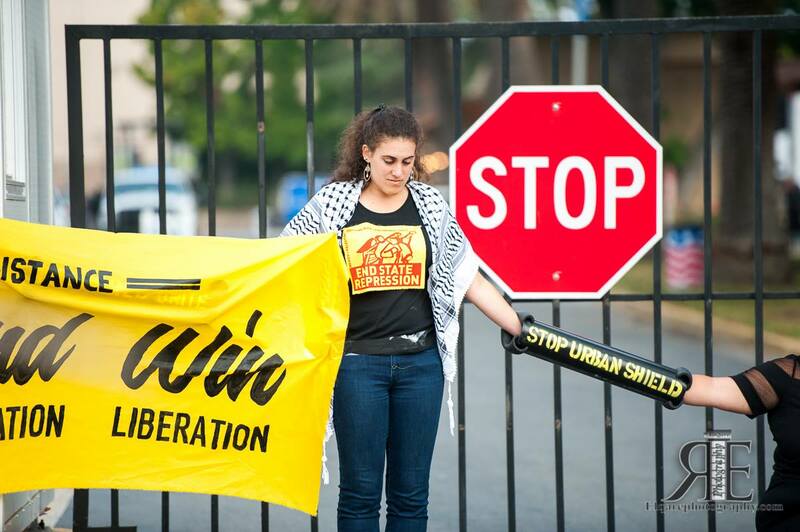 Take Action to Stop Urban Shield Today!